Random radio jottings: Any Questions? Have you ever spent Thursday night shouting in indignation or exasperation at the telly? Then you've probably been watching another edition of Question Time. That programme has been running for just over 39 years now and when David Dimbleby's tenure comes to end this year he'll have been just the third regular host. 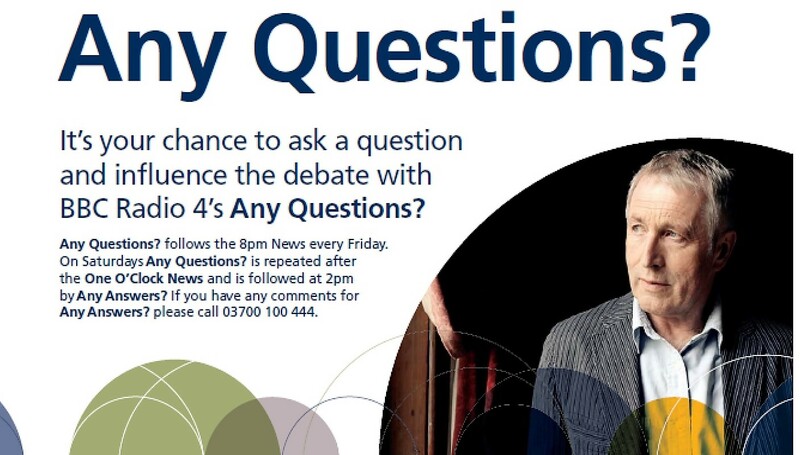 However, that's nothing compared to the programme that Question Time is based on, radio's Any Questions? This week this venerable radio institution celebrates its 70th anniversary. It too is presented by a Dimbleby, Jonathan in this case, who's the fourth incumbent in the role of chairperson, and he's been in the job for 31 years. To trace the programme's early history you have to go back to the post-war days of the Home Service which was very much run on a regional basis. The regions took programmes from the centre, what was known as the Basic Home Service, and supplemented this with their own locally produced material which may or may not have also gone on to enjoy a national audience. Head of the West Regional Programmes was Frank Gillard, at the time best known to radio listeners as one of the team of War Correspondents on the BBC's War Report. It was Gillard that was instrumental in getting Any Questions? on air and giving it the support to ensure that it was heard across the BBC on the Light Programme and the full Home Service. The programme had come about quite accidentally when in the summer of 1948 the West region had been thinking about an inter-county quiz to plug a gap in the winter schedule. The quiz idea was dropped in favour of a kind of Brain's Trust but one that, according to Gillard, was aimed at "the masses" and would have "an audience of millions". He was keen to "get away from the artificial atmosphere of the studio as much as possible and take the microphone among the people." An initial series of just six programmes was planned and the inspiration for programme format came from another touring programme that had started in 1947 called Speak Your Mind in which chairman Gordon McMurtrie put a number of questions (sent in by listeners) to a representative audience in whatever town it was visiting. Audience members were encouraged to express their views openly and spontaneously at the microphone. Whereas Speak Your Mind posed questions on "matters which can be usefully discussed in terms of everyday experience and ordinary common sense" Any Questions? raised subjects "upon which the ordinary listener feels he needs help and guidance of expert opinion." 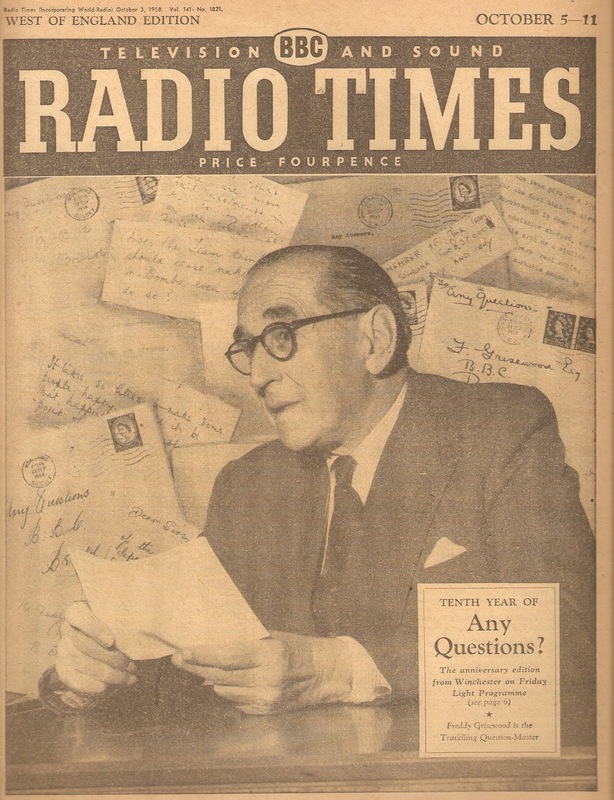 The first programme on 12 October 1948, came from the Guildhall in Winchester, with a team consisting of Naomi Royde-Smith, the novelist, who lived in the city, Honor Croome of The Economist, Jack Longland, then Chief Education Officer for Dorset, and Hampshire-born John Arlott at that time a BBC talks producer. The first question - from the Lady Mayor of Winchester - was "What effect would it have if women were able to exert more power in professional politics and diplomacy?" 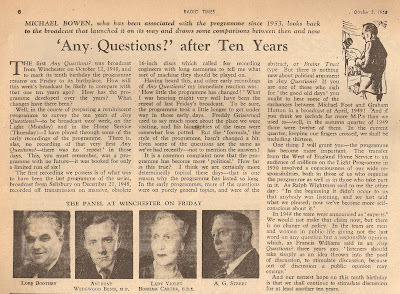 In the wartime Brains Trust (originally called Any Questions?) the team had sat in the cosy isolation of a studio. That evening in Winchester the presence of the audience and the fact that the team was confronted by the questioners revitalised the formula in precisely the way Frank Gillard had hoped, and he was sure they were on to a winner. 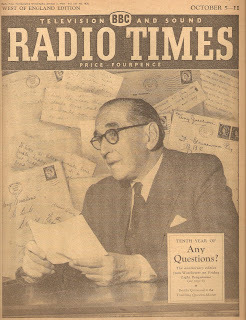 At the end of the half-hour, while the members of the team were thankfully sipping drinks in the Mayor's Parlour, he was on the phone to the Radio Times printers, where the presses were already rolling, to extend the next programme, a fortnight later, to forty-five minutes. There was soon no more thought of a limit to six editions. Frank's aim became more ambitious - to attract a mass audience and, by making the programme as entertaining as possible, to set up a wave of conversation in millions of homes where perhaps they wouldn't listen to conventional talks programmes. The first producer was Nicholas Croker, and he and Frank had eighteen months to develop and mould the programme in the comparative obscurity of Regional broadcasting. 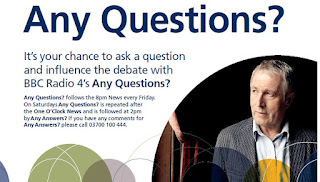 It gradually became more topical - hints to the audience that questions on current affairs were more likely to be selected than purely general ones had their effect - and this became an important factor in the programme's longevity. The number of politicians on the panel increased. teams were gradually persuaded t discuss issues rather than deliver four separate monologues. John Arlott appeared every week at this formative time, and with his producer's instinct was able to help shape the discussion by his own example. Jack Longland was also helpful. In June 1950, the Friday evening broadcast moved on to the Basic Home Service, heard all over the country. But the real breakthrough came three months later on 22 September when Any Questions? moved to the Light Programme, with a repeat on the Basic Home Service on Tuesdays. 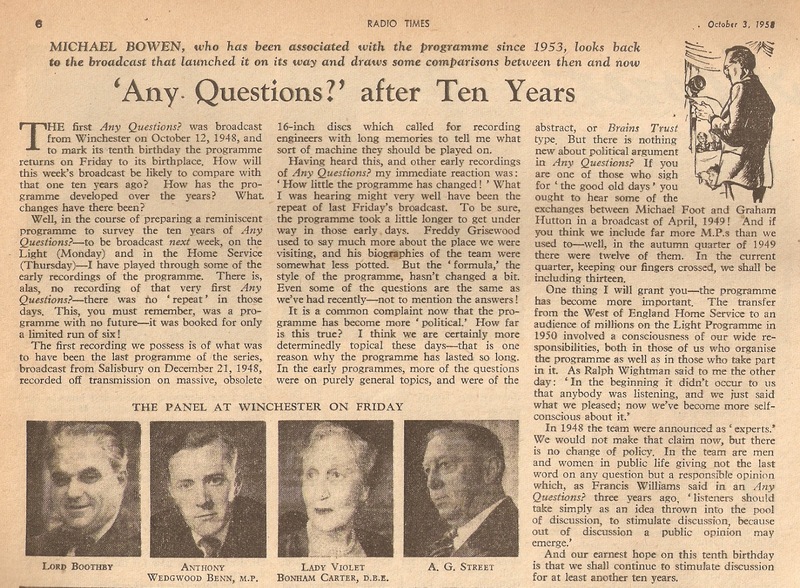 Within quite a short time, sixteen million people were regularly listening to the programme. Frank Gillard had got his mass audience. Here's Frank Gillard talking about Any Questions? on the occasion of its 40th anniversary in 1988. The programme's first presenter, initially billed as the "travelling question-master" was Freddie Grisewood. He'd been broadcasting since the mid 1920's firstly as a singer and then joining the staff of the BBC as an announcer and commentator in 1929. He presented hundreds of programmes including The Kitchen Front and The World Goes By during the War and Those Were the Days, Victorian Album and Film Times post-war. For many years he was one of the BBC's tennis commentators at Wimbledon, alongside Max Robertson and Dan Maskell on both radio and TV. As well as touring with Any Questions? he was also covering the country as the chairman of Gardeners' Question Time between 1953 and 1961. Freddie's failing health in 1967 led the producers to search around for a replacement. Bamber Gascoigne was considered - he was an occasional panellist - before David Jacobs eventually took over in early 1968. 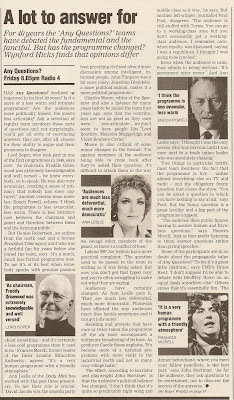 John Timpson replaced David in 1984 when producers wanted a sharper more journalistic edge to proceedings. From September 1987 Jonathan Dimbleby became the chairman, coming from a mainly ITV current affairs background. There are extracts from Freddie's era on Any Questions? on the BBC Archive site. These clips include some lively discussions during David and John's tenure and the introduction to Jonathan's first appearance. Radio 4 is marking the 70th anniversary with a special edition this Friday evening. Coming live from the House of Commons the panel and the audience are all aged 18 to 30. And then on Saturday night Archive on 4 includes plenty of archive recordings and features a discussion about the programme recorded in the Radio Theatre with a panel consisting of Bonnie Greer, David Blunkett, Matthew Parris and Ann Widdecombe. Of course, for the first twenty years or so 'Any Questions?' only ever came from venues in the old BBC West Region (basically the Westward-and-successors & HTV West areas plus most of the Southern-and-successors area) which, considering that it was broadcast throughout the UK, very much confirms the point often made about Reithianism - that it greatly over-represented rural areas relative to how much of the population had lived in them since long before broadcasting began, and greatly under-represented industrial areas relative to how much of the population lived in them by that time. 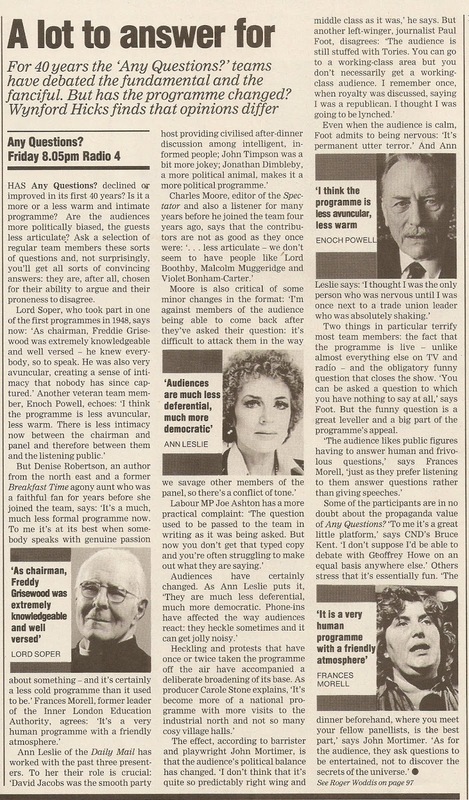 This was the same reason why the likes of Granada & Yorkshire were typically ITV's strongest areas in the 1970s & 80s. Keith Waterhouse mentioned this in his Mirror column about the disruption of the programme by demonstrators against Enoch Powell in 1976, when the standby music was still "Sir Roger de Coverley" - that he had long resented the rather cosy, Tory air of the programme, but now saw it as a lesser evil than the emerging militancy and extremism of New Left and New Right alike.